Eptakomi is a village in the Karpasia Peninsula of Cyprus and is on the eastern edge of the Pentadaktilos mountain range. The Greek inhabitants of Eptakomi were ethnically cleansed following the Turkish invasion in 1974. Prior to the invasion, ¾ of the population of Eptakomi were Greek and ¼ Turkish who all lived together peacefully. 2-3 miles from the village. The highest rocky outcrop is “Yiouti” with a shear cliff edge containing two huge caves facing the sea. The southern landscape consists of hills and plains extending 7 miles to the southern coast of the Karpasia peninsula. It is believed the original village was known as Gnaptokomi or village of the Gnaptodon, meaning producers of leather products made from animal skins. 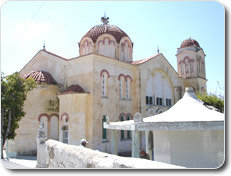 It is believed the present name of Eptakomi came about following the amalgamation of 7 surrounding smaller communities (the remains of these can be seen today at the locations known as: Ayios Epifanios, Archangelos Michael, Ayia Agathi, Agia Erini, Apostolos Loukas, Naptokomi, Gnaptokomi). Prior to their displacement by the Turks, the majority of Eptakomides farmed the land and kept animals as shepherds. Now Eptakomides can be found all over the world including the UK, USA & Australia but longing to return to their parental homes but free from the Turkish occupation.